Are you new to wrestling and in need of some new shoes? Maybe you’re already an experienced wrestler that is looking to change or upgrade footwear? Regardless of your skill level or situation, like with any sport, finding the best wrestling shoes is a priority for all wrestlers. However, finding the perfect pair isn’t always as straight forward, purely because there is so much choice on the market, and also due to ever-changing technologies to cater for ever-demanding consumers. To make things easier for those in search of new wrestling shoes, we’ve researched and determined the top choices for wrestlers that can help give you the edge over tough opponents. In this article we give some tips and recommendations for combat footwear based on our findings for wrestlers, and other compatible sports. You should choose wrestling shoes based on your skill level. You’ll notice that some of the products we review below explain that they are either for beginners, or entry-level wrestlers. You will also want to determine whether you are going to use these strictly for wrestling, or perhaps wear them for other sports like boxing, or mixed martial arts (MMA). If so, there are plenty of options that work well across multiple sports. Another method to select the best wrestling shoes is based on size. Typically, they should fit tight. 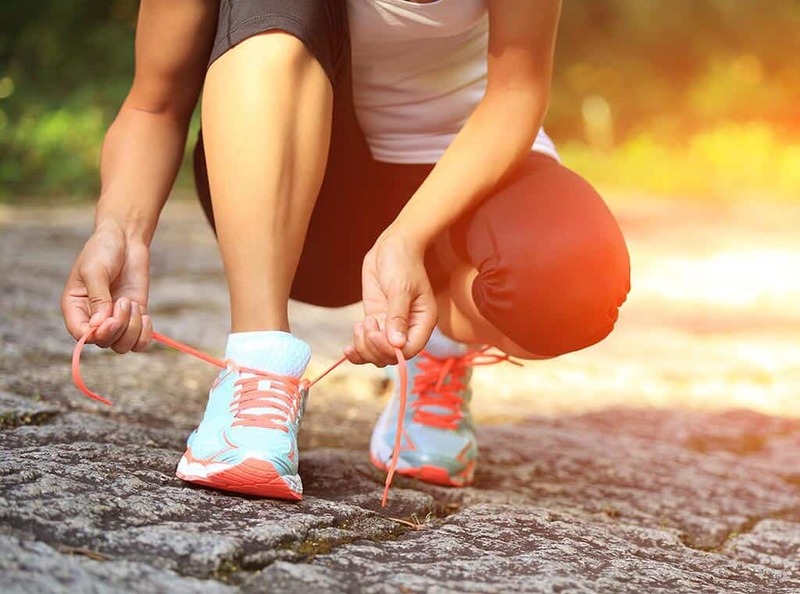 Certain company brands recommend that you buy a half-size or an even full size smaller than your normal gym, running, or walking shoes. So just keep an eye out for sizing and how the shoe fits. One of the first things physical things to look for is the ankle height and support. Based on your personal preference, you can get shoes with higher or lower ankles. However, there are benefits to each. Although some of the shoes on our list are interchangeable between sports, there are certain factors that separate wrestling sneakers from other sports like boxing. 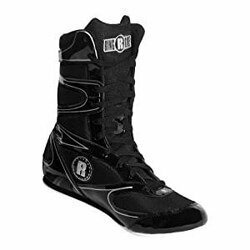 You can buy high top wrestling shoes which have a higher ankle, but typically they are lower cut compared to boxing or kickboxing shoes that come up higher towards your half. The reasoning behind this is because boxers need to stand up straighter than wrestlers and have a greater chance of twisting or breaking an ankle. The crouched position of a wrestler allows them to have a shorter ankle length. Footwear need to be flexible so you can freely move your feet in competitions. For these to be flexible, they are normally made from lightweight synthetic materials as opposed to boxing shoes that are made from suede or leather, which is slightly heavier. The final aspect is the soles. Compared to boxing shoes, wrestlers use shoes that have a rigid grip that gives them more traction against the mat. Usually, you can find wrestling sneakers with grooves or circles that allow for easy movement during training and competition. 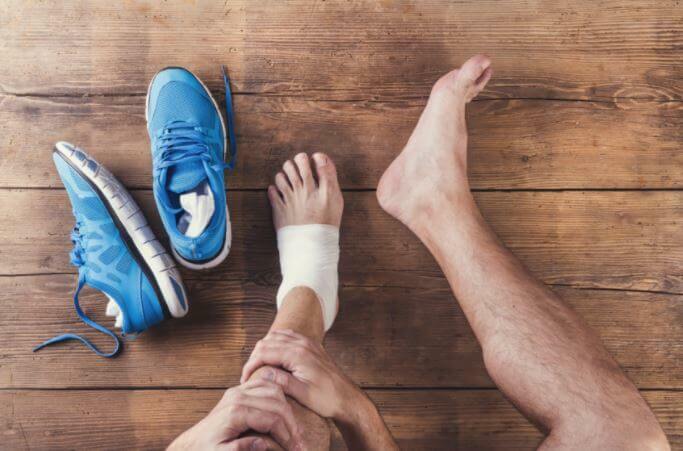 The sports and fitness experts at Livestrong explain that the main advantage of wearing good wrestling shoes is to prevent you from slipping and falling on the mat. You’ll want to find shoes that provide adequate traction to leverage and maneuver against your opponents while you’re standing as well as on the ground. However, you don’t want the traction to be too sticky, or you’ll feel like you’re getting caught or stuck on the mat. Another benefit of wrestling shoes is that you’ll be able to compete in competitions. The United World Wrestling Organization explains the shoe regulations if you want to participate in tournaments and other matches. Buying shoes that are specific for wrestling ensure that you’ll meet the standards and guidelines for their rulebook. Now that you’re familiar with the characteristics of choosing wrestling shoes and what you need to look for, it’s time to find a pair that’s best for you. We researched and reviewed the top 10 wrestling shoes available in 2017, which can be viewed below. The Matflex 5 from Asics has a rubberized sole, lace garage, and a full-length gum rubber outsole. It’s made from very lightweight textile and synthetic materials. These are a great pair of cheap wrestling shoes, perfect for entry level so if you’re just getting into the sport and you’re not sure where to start looking, the Matflex 5 is a perfect starting point. Asics has been a trusted manufacturing brand in the athletics industry since 1977. Although the company originated by creating basketball sneakers, they eventually developed and expanded to other sports including wrestling. Additionally, Asics running shoes are known to be among some of the best in the world. Their brand represents comfort and performance, and these Matflex fit the bill for both points. They have outstanding breathability to keep your feet dry, which is important while you’re training and sweating profusely. 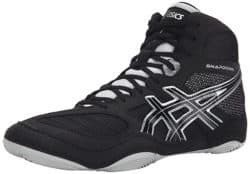 You’ll also experience very good traction while wearing the Asics Matflex 5, which will give the edge over your opponent so you can maneuver for leverage without worrying about slipping on the mat. The Adidas Combat Speed 4 fit like a sock. It has an integral support strap to emphasize the snug fit. They are also extremely flexible so you can maneuver with ease while performing complex moves. These also have the proper support to keep your feet and ankles safe to avoid injuries. They are made with a suede and leather outsole; both of these materials overlay with one another to provide a strong and tight grip to the mat surface. You’ll have the proper amount of traction without feeling like your feet are getting stuck. Adidas recommends buying a half size larger than your current running shoes, reason being is because of the snug sock-like fit for these shoes. Although the Combat Speed 4 are men’s shoes, women can wear them too. You would just need to find the appropriate conversion from men’s sizes to women’s. The Asics Snapdown were made with a full-length rubber outsole, leather, and synthetic materials. They also have an integrated lace garage, and are deemed great for mid-level wrestlers. If you are ready to upgrade out of your beginner pair, these might be the ones to consider as an option. The Snapdown’s have built-in traction pods in both the rear and forefront of the shoe, which were made to increase the grip to the mat while retaining comfortable flexibility. In addition to flexibility, the mesh creates enhanced breathability. The aesthetics are also very pleasant, which creates an overall appealing look. 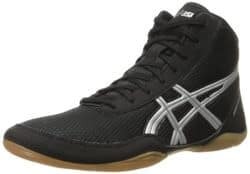 Compared to the average wrestling sneakers, the Asics Snapdown have a slightly stiffer sole, which creates a slightly restricted movement for certain positions. They have a wide range of sizes that go up to 15 Men’s US. Not all companies manufacture shoes that large, so if you have big feet, then you can check these out as an option. Wrestlers typically sweat while training and competing in matches. The Adizero Wrestling shoes are quick drying, which is good for limiting sweaty feet problems and harmful fungus from growing when you take your shoes off after a session. These same materials keep your feet cool and dry while you are wearing them as well. 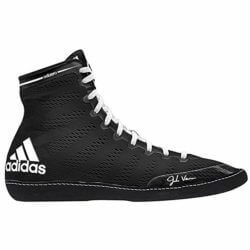 The Adidas Adizero are very versatile; in addition to wrestling, you can use them to train for boxing or MMA. Although boxing shoes normally have more of a curved sole, these provide enough cushioning to use in the ring. They are breathable and flexible; wrestlers won’t experience any restrictions on the mat. The shoes create a nice balance of sliding ability and friction, so you won’t slip but can keep a strong traction. There is no lace garage to hide the laces and prevent them from flapping around while you wear them, so you’ll need to tape your shoes every time. They take about a week or so to break in, which can be a painful process. The Adidas Response 3.1 has a mesh upper layer and rubber sole, and is made with synthetic and fabric materials. Unlike other wrestling sneakers, these don’t run too narrow, so they are suitable for people with wide feet. They fit tight to your feet and don’t have lots of extra padding, which make them strictly for wrestling as opposed to boxing. There is a strap at the top for additional support, and you can also hide the laces beneath it as well. It has a wrapped heel to provide traction if you happen to find yourself in some tough spots and difficult positions during a match. For people who do powerlifting in addition to wrestling, you can wear these while you lift weights without an issue, as they help keep you grounded in the weight room. The various bright color options also draw some attention to make you stand out from the crowd. The Ringside Undefeated High Top shoes were made for three different sports. You can wear these for wrestling, boxing, and mixed martial arts (MMA). Since it’s common for people to train in multiple fighting disciplines, you won’t need to look for three separate shoes if you choose to select these. It’s made with nylon and mesh that is extremely breathable. The rubber sole is non-slip, so you won’t have to worry about falling and becoming a vulnerable target for your opponent. Since these are high top shoes, they provide you with additional support for your feet, ankles, and joints to prevent injury. Outside of their functionality in the ring, they are also extremely comfortable. You won’t get sores or blisters from wearing these while fighting. They are also very lightweight; it’s important to avoid wearing heavy shoes while training and competing for wrestling because they impair your agility. They run slightly big, so you may want to consider purchasing a pair half size or even full size smaller than your regular sneakers. However, they aren’t too narrow, so you can still get these if you have wide feet. The Asics JB EliteV2.0 has a split sole design that is made from rubber materials; there are two traction pods in each section of the sole, the front and the back. The purpose of these pods is to help provide an additional support and traction. You’ll also notice that the JB Elite V2.0 have great flexibility. 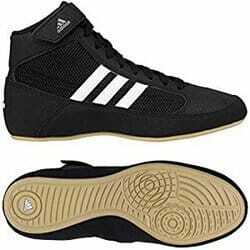 The tongue is smaller than other low top wrestling shoes, so it’s not bulky, and it’s certainly more comfortable. It also has a lace garage to prevent your laces from falling out during a competition, and is one of the smaller lace garages available on the market which is a bonus. The entire design meets all tournament regulations. It has a breathable construction with a mesh layer to keep your feet dry during training sessions, which also provides added comfort and a conformed fit to your foot. If you’re into other combat sports besides wrestling, you can use these for both boxing and kickboxing (Muay Thai) too. Their versatility and design make the JB Elite V2.0 from Asics a popular option for multi-sports athletes. The HVC2 Speed from Adidas has different materials including mesh, synthetic suede, and synthetic leather, which by creating with a combination of fabrics, the shoes end up being lightweight and durable. The mesh layer creates breathability to keep your feet cool and dry while you wear them and prevents odor and mold forming when you take them off. These shoes also have a unique way to cover your laces. The top strap has an elastic retention cover that prevents your laces getting in the way of your training, which could cause you to potentially trip over your own feet. The outsole allows you to maintain consistent contact with the ring since it’s full-length. No matter what position you find yourself in during a competition, you’ll have the ability to find superior grip from all angles of your shoes. You’ll quickly discover that the Adidas HVC2 is super lightweight and enhances your agility in the ring. Unlike other new wrestling shoes where you need to buy a size up or down, the verdict is that these run true to size. The Ringside Diablo have additional ankle support, which is hard to find with low top wrestling shoes. It helps prevent injury to your feet and ankles with the added support, while not restricting your movement on the mat. You can use these shoes for more than wrestling, for example, Ringside also created the Diablo to be compatible with Muay Thai and other mixed martial arts (MMA) in addition to wrestling and boxing. They come in bright color options so you can stand out from the crowd and your opponents during competitions. The extra attention can help put you in the zone to win. These shoes are made with practical materials like nylon and mesh to let your feet breathe during training sessions. They are also available in both men’s and women’s sizes, so you won’t have to worry about figuring out size conversions between genders. You can also use these for lifting weights because they provide great support and traction that power lifters need in the weight room. 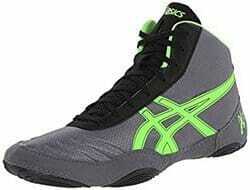 The Asics Dan Gable Ultimate 4 has a rubberized sole to give you excellent grip on the wrestling mat. Furthermore, the shoe is split between the front and back section, which provides extra flexibility and traction while you compete. It also has a new and innovatively designed upper section that conforms to your foot with a compression system. The design also contains polyurethane pads for added support and increased comfort. 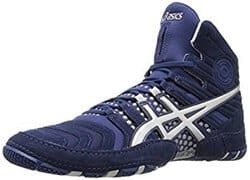 Asics also made the tongue less bulky than some of their other wrestling shoes, so it won’t interfere with flexibility or irritate the top of your foot. These shoes are also very light, enabling you to be quick and agile. The lace garage is an added benefit to keep the laces out of your way as you train and compete. You won’t have to use tape every time whilst putting your shoes on because the lace garage eliminates that need. After weighing up the pros and cons of each, our opinion is that the Ringside Undefeated High Top are the clear winner of this roundup. These hit all of the qualifications of a great all rounder for wrestling and other combat sports that we outlined earlier. They are lightweight, comfortable, and give you outstanding traction in the ring. Furthermore, they are versatile. If you are a wrestler that also does boxing and mixed martial arts, you won’t need to buy different shoes for each sport, because the Ringside Undefeated wrestling shoes are suitable for all of those. Unlike other reviews here that may be tight or narrow, these fit good but also have a generous toe box, which makes them suitable for people with wide feet. 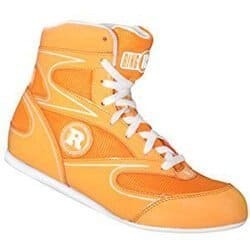 They also have extra large sizes ranging up to a US Men’s size 15, which is hard to find from other brands. 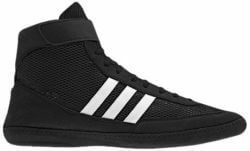 If you want a pair of top rated wrestling shoes, you can’t go wrong with the Ringside Undefeated High Top.